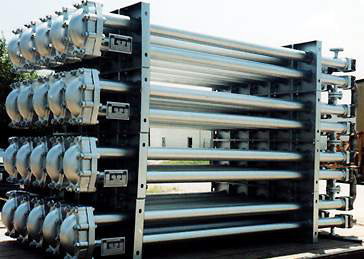 A double pipe heat exchanger is one of the simplest form of Shell and Tube Heat Exchangers. Here, just one pipe inside another larger pipe. One fluid flows through the inside pipe and the other flows through the annulus between the two pipes. The wall of the inner pipe is the heat transfer surface. To make a Unit very Compact, The Arrangement is made Multiple Times and Continues Serial and Parallel flow.